I’ve been working in a new GUI for Voxel, this is still based on NanoVG for drawing but uses a new layout and display system. 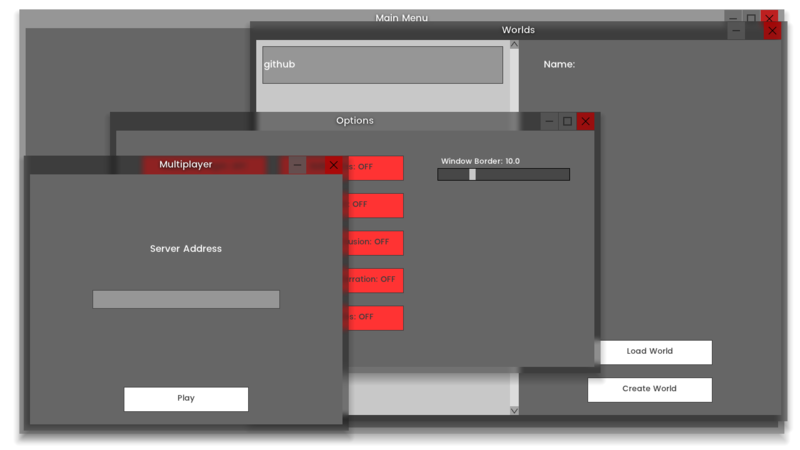 This is based on the idea of a Window Manager/Display Server, all the GUI is composed of “windows”, each window is composed of components (Buttons, Images, Text, etc), making the creation of menus more easy and fast. Of course custom windows can be made by extending the NanoWindow object. Internally the Window Manager/Display Server uses a compositing renderer, this puts together all the windows and creates the final image that is displayed. Each window contains a buffer where everything is rendered, this is shared between the client-side area and the window frame. The logic (drag, maximize, close, etc) and decorations are done by the window itself, not the window manager. The Window Manager takes the image of the buffer, applies custom shaders and then adds it to the final buffer. This is done in a back-to-front rendering. Because of the dynamic nature of NanoVG the entire rendering can be replaced or modified on-runtime.